Sean and I went to a Sunday matinee this early afternoon in order to see Pirates of the Caribbean: At World’s End. It turned out to be a pretty good flick, though I’d say it could have used some more editing. Some really, really funny moments, though, and the Keith Richards cameo was priceless. After the movie, Sean and I decided to walk home so that I could do some more River Bird searching. On the way, Sean took me for a tour of his new office in Tribune Tower! It’s a really, really cool place and I am so proud of him. Not to be falconcentric, but he also has a view of Allerton, one of the first nesting sites of the River Birds. I told him to keep his eyes open for them, just in case. That’s my guy — loves his wife so much, he looks for signs of bird poop. Finally, I saw an adult peregrine. It was sitting on the northeastern corner of the Pittsfield Building. It took off right as I spotted it, swooping down and out of sight. We tried to follow it through the narrow corridors of skyscrapers, but lost it quickly. I noticed both our stomachs were audibly growling, so we began wandering south again towards the home territory. When we passed the Plymouth Restaurtant and Bar some time later, the smell of cooking meat pulled us in. We went up to the rooftop bar and sat down at a table on the railing. 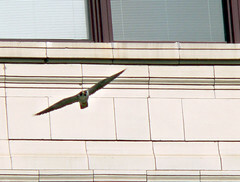 It didn’t take long before one of the MCC adults put in an appearance, sailing in from the west to land on the Depaul building across State. We watched it as it scanned the air, looking for any interesting prey before hopping off and gliding to the north, out of sight. Tonight, just before the last of the light left the sky, I saw one adult sitting on the MCC camera pole and the other sitting on the SE corner of the EPA building. ‘Night, Jailbirds! ~ by Steph on May 27, 2007.